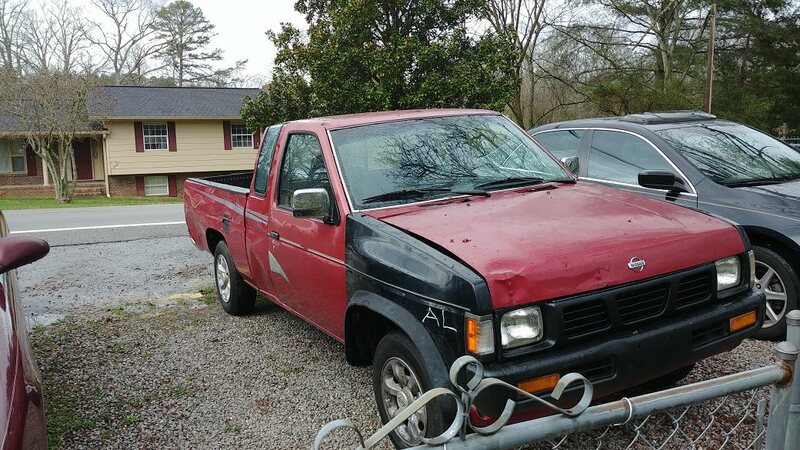 This is a 1996 King (Kang) Cab that I picked up to teach myself how to work on cars. It's going to provide plenty of opportunities for that. 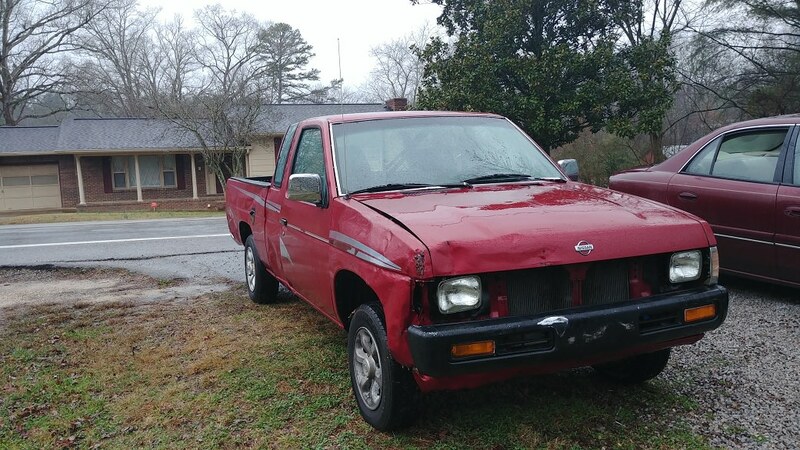 At this point, I had disposed of the duct-taped grille. I had also replaced the bumper with a straighter one. Of course, the core support is bent beneath it all, and I do not plan to weld in order to fix it. I'll have to outsource that work in the future some time. This angle shows the pre-existing mismatched door and the large array of dents on the passenger side. These will be a totally new experience to me (in terms of fixing them). 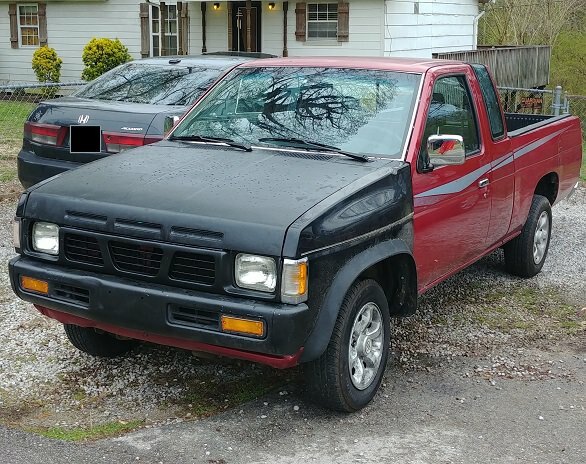 The passenger fender and the grille were toast, so I went ahead and grabbed a 4x4 fender to replace it, and a grille from a different pickup. I'll find the back end skirts later. Also, the fuel filler door was from the same donor pickup. Of course, I simply couldn't just have ONE 4x4 fender. That'd be a ludricous display. My replacement marker light (passenger side) was black, and the driver's side replacement to match is on its way. 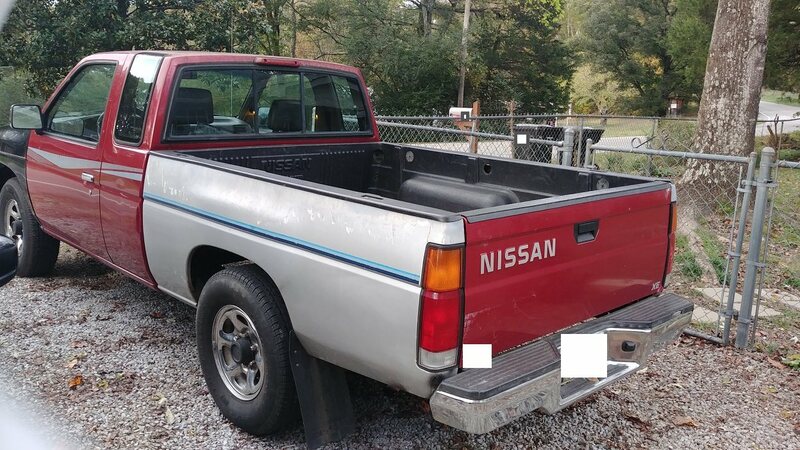 A 1987 pickup from the pick-your-part was my next donor. I prefer the 3-vent hood, and its being available was a nice coincidence. I had to get the 3 vents themselves from another nearby pickup. It's flat black for now, but I'll do a full paint job somewhere down the line. Here's where I stand on it from the other side of it. 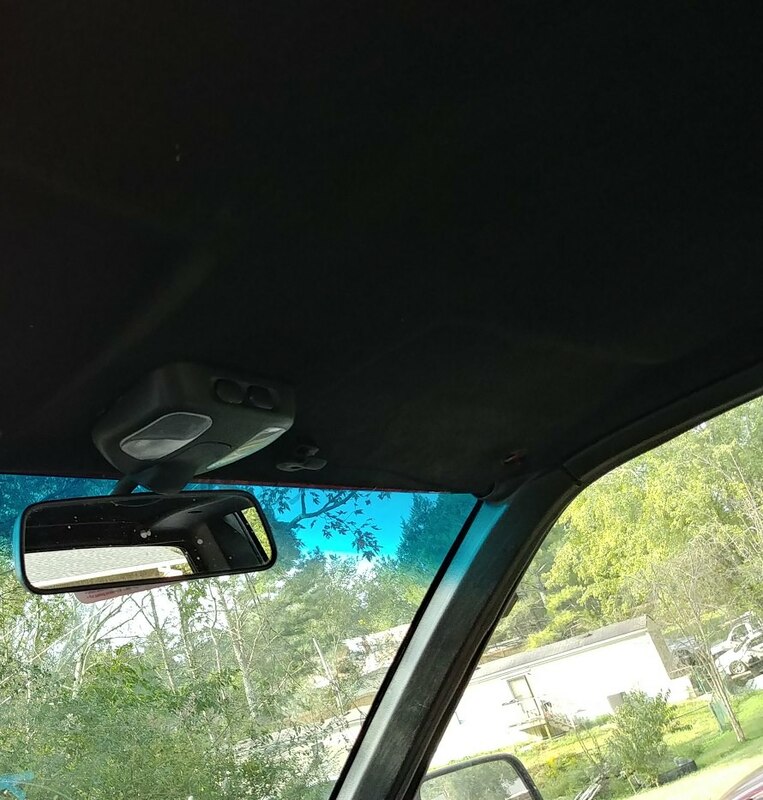 Replaced the headliner (and by anyone's standards, I butchered it, but it's a far cry from the sagging mess that was once there. I'll go back and do it right one day. Currently, I'm painting (with duplicolor vinyl+fabric paint) the entirety of the interior. 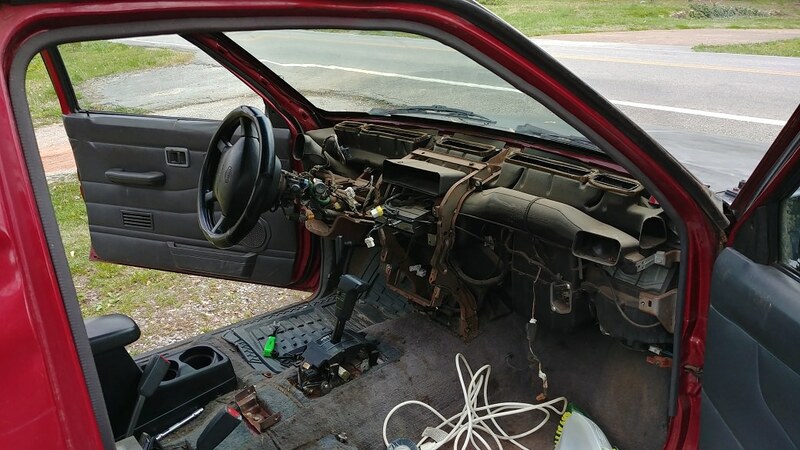 During that process, I'll be changing the dash light colors to red, and attempting to clean the coffee-dyed carpet. 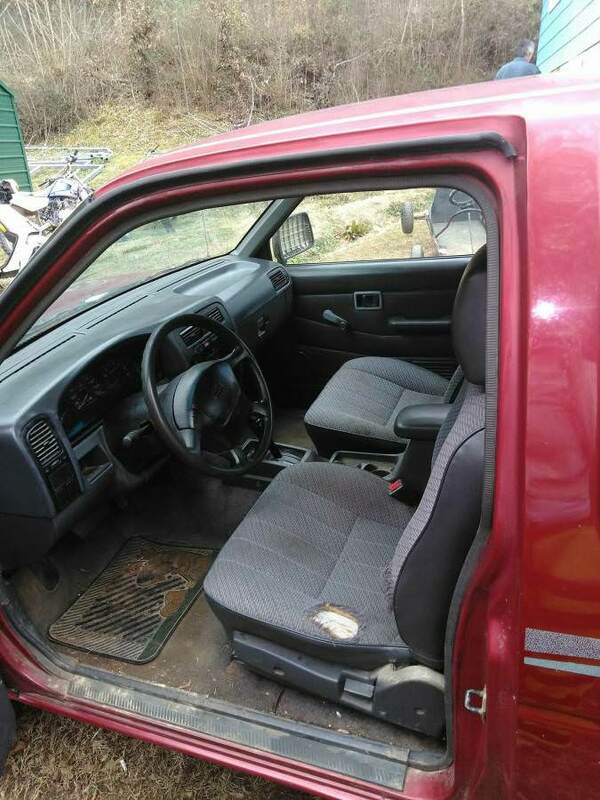 Replacement kingcab carpet for my truck was under 150 bucks. You gotta cut every hole in the new stuff yourself. It wasn’t too hard to do, it just took an entire afternoon. 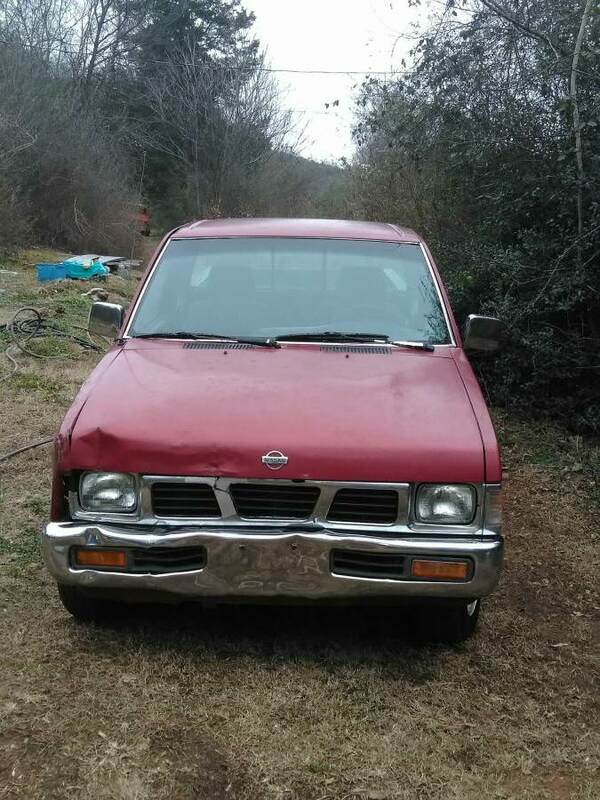 Welcome to infamous Nissan! Looking good so far. You can remove and pressure wash the carpet. I soaked mine with purple power and pressure washed the hell out of it. The most important part of the process is drying it. I hung it over the fence for a few hours to let most of the water drip off. Then put it over a saw horse with fans blowing on it. A leaf blower works better but my leaf blower quit and I haven’t bought another one. You need to make sure the carpet and padding is 100% dry before you reinstall it or it will mildew. 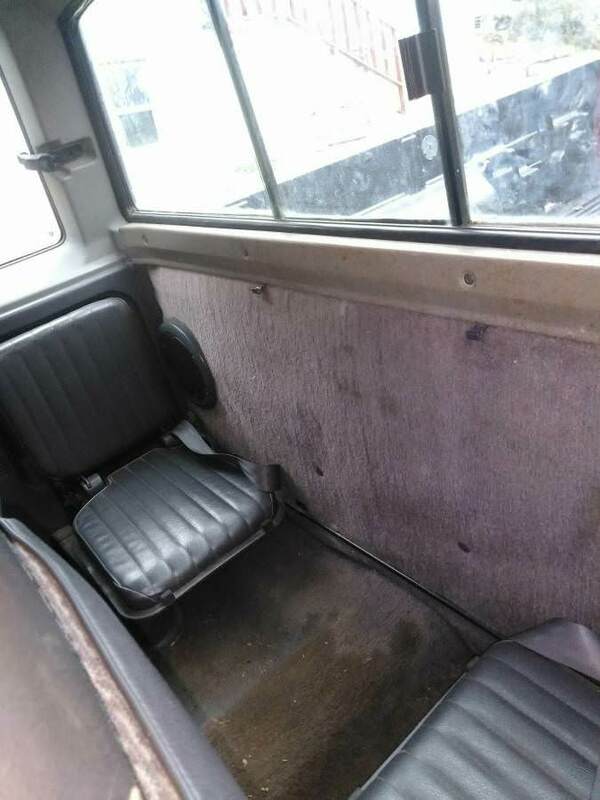 i have those same style seats, and my driver one is worn on the same side, but on the back part of the seat. every time i wear a pair of jeans, the thing tears a belt loop off. it pisses me off. 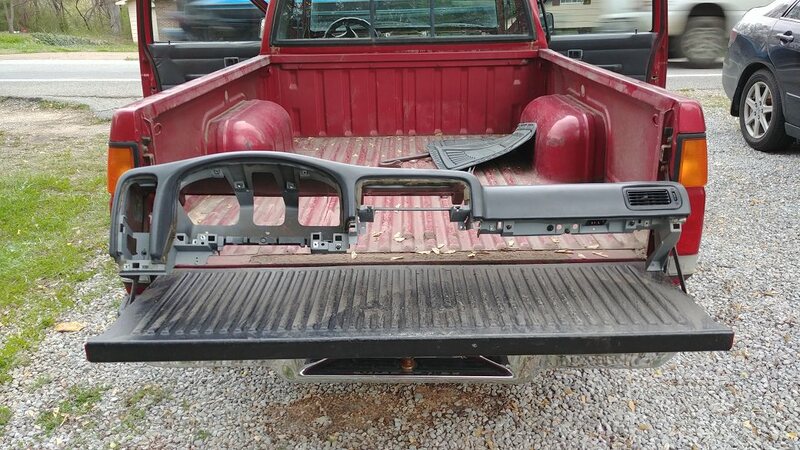 This weekend, I decided to take very plastic part out (door panels+handles not included just yet) and paint them black. 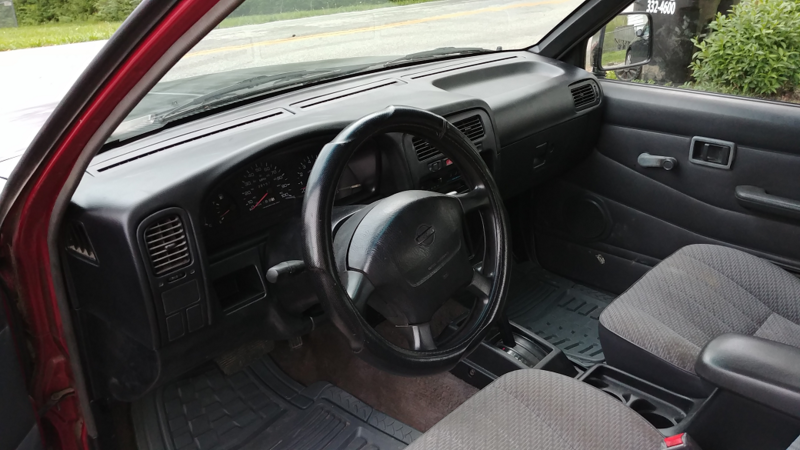 I used Dupli-Color Vinyl+Fabric Matte Black paint, which is specified to be good for dashboards, door panels, and other interior plastics that undergo hot/cold cycles of expanding and contracting. I scrubbed all the pieces down with a dishes brush and some strong sudsy bathroom cleaner. Just before painting, I wiped each piece down with acetone to strip off any treatments and possibly the top layer of whatever's on there. Here's the jumper seats removed, and all of the associated plastic also removed. There was plenty of stuff to clean out! Finished with the dash recoloring! It's black now, which is neat. 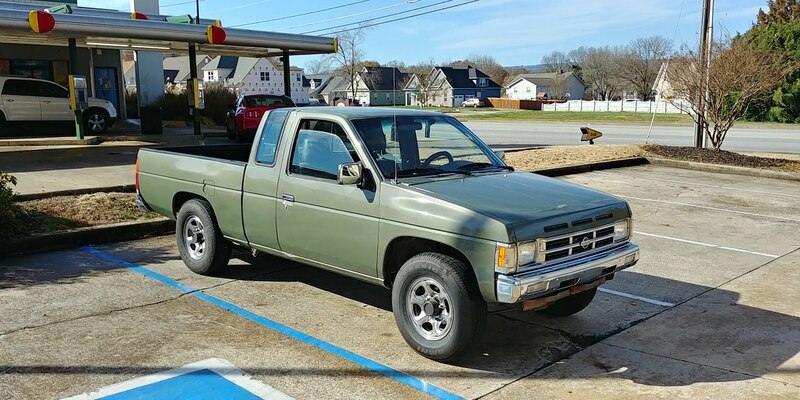 Next up on the interior renovation will be the door panels themselves, which I would like to replace with the style seen in that post "Project Time Capsule", but colored more for my truck. Hell, I'd be happy just to get that style and figure out color later. Yes, I know they're for power windows. I'll probably install some, because why not?! Okay. So, I forgot to update this post! A lot has been done, So I'll section this off into three replies. 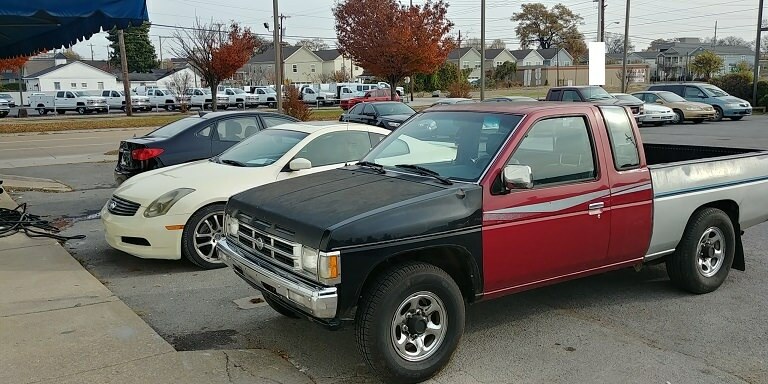 It was Flat Black, Gloss Black, Burgundy, Red, and Silver. This is also the last picture with the default 2wd 14 inch weels+tires. The next picture is with the new 15-inch default 4WD wheels (no, I didn't swap in 4WD because I'm not *that* determined to change things!). This gives you a better view of the peeling clearcoat, primer, and pinstripe amalgamation that made up the cargo area of the truck. Alright folks, these changes took place a couple of months later. 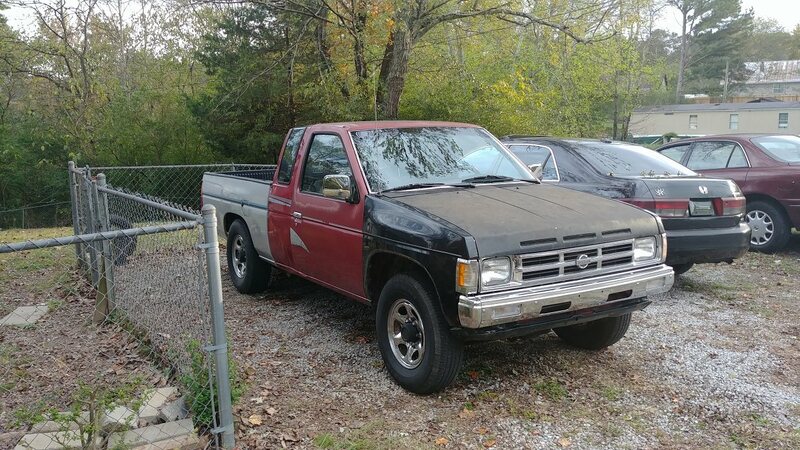 I got tired of how cheap the all-black front end components looked, and I discovered my love of the early Hardbody Front Ends. 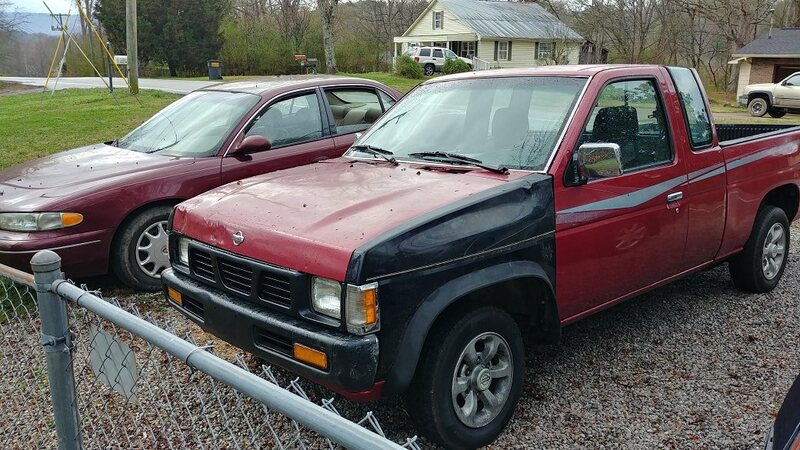 So, I found a perfect early bumper, grille, and turn signals (the donor '93 SE the parts came off of was a shame to see in the junkyard). 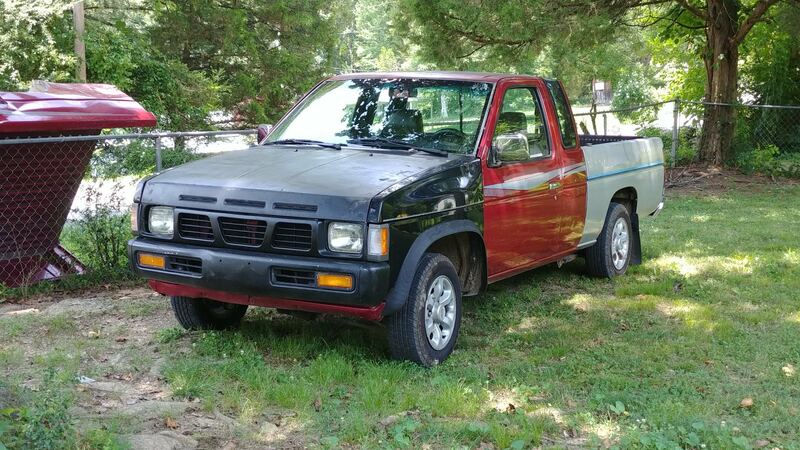 The grille and turn signals matched very well to the mail-slot hood. The mail-slots really "popped" with the three sections of the grille. Mounting this bumper required cutting and welding of the two different bracket styles, and who really knows if I did it *exactly* right? I decided to also go with the clear signal covers rather than amber, to give the truck a more refined look. Just wanted to include the mirror update! I went from a windshield-attached mirror to one that attaches directly to the "ceiling". Unfortunately, this upgrade was hard to find. Usually, the dome light and mirror mount are an either/or thing, but there are a few little Nissans with a built-in combo. It's very worth it for any of you all to seek this out. 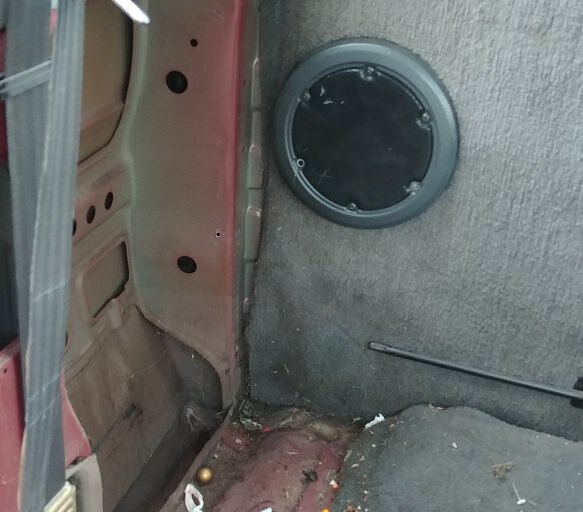 Word of warning: You will need to go ahead and cut a hole in the headliner to get to the screwholes. 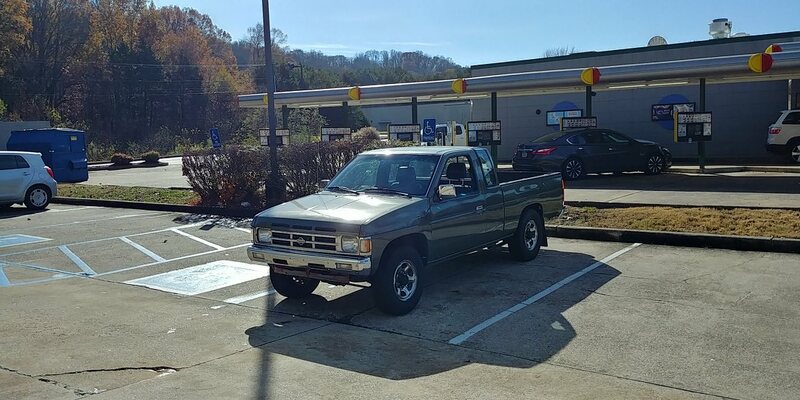 "I'm sorry you're having to deal with that..thing"
Also, I got a better bedliner from a '93 SE that was actually Nissan branded and had the cutouts for the tiedowns.